The Boston & Albany Railroad was founded in 1867, leased by the NYC in 1900 then purchased by the NYC in 1961. A beloved RR in the areas it served. 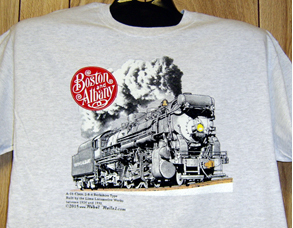 NEW TEE DESIGN of one of the Boston & Albany Railroads most famous locomotives, the historic Berkshire Super Power steamers. Feel the heat. 6 inch x 6 inch square tin logo sign of the Boston & Albany Railroad. 11oz coffee mug featuring a beast of a locomotive, the Boston & Albany #1442.